The very first meal I prepared with my new oven is one I will never forget. It was Thanksgiving, 2013. We were a small group, and the gas range had yet to be hooked up, yet I was bound and determined to cook us a feast. After all, I had two (electric) ovens at my disposal and I love a good challenge. I set a pumpkin pie in the top oven of my KitchenAid dual fuel range, and set the lower oven to ‘convection roast’. The manual for my range, which coincidentally had a roast turkey on the cover, stated that the cooking time would be reduced by 15-30 % on convection roast and how right it was. My bird finished is just under 2 hours, which gave me plenty of time to whip up a few sides and bake them along side the turkey. Thanks to the Even-Heat true convection technology in the oven, the turkey stayed moist while the potatoes crisped up nicely. I made cranberry sauce and gravy in the microwave, as well as a bowl of steamed corn, and we sat down to our official Thanksgiving meal feeling very thankful indeed. I can’t wait for Christmas to do it all over again, this time with the five gas burners also at my disposal. It’s the KitchenAid dual fuel double oven range with Even-Heat technology, featuring five burners, plus an option for a griddle (pictured). This appliance is making my life a heck of a lot easier and it is a huge relief knowing that my recipes, both for the upcoming cookbook and this blog, are tested with the precision that this range offers. Since we’re not near a natural gas line, we purchased a propane tank and had the line put into the house. It was a hassle-free conversion and one that I won’t regret. I put that middle burner to the test right away with an enormous pot of chicken stock. It maintained an even simmer the whole time, resulting in a very clear stock. We’ve cooked up homemade flour tortillas on the griddle as well with great success. I’m so glad I went for the double oven, which came highly recommended to me by friends on Facebook. 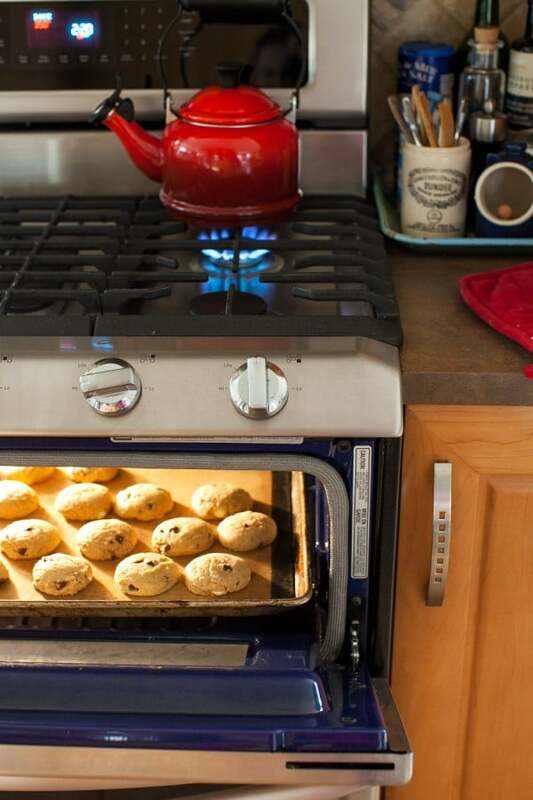 It’s incredibly handy to heat just one small oven for things like toasting nuts or baking a few cookies for an after school snack. Cooking pro tip? Keep a tray of basic condiments – cooking oil, olive oil, salt and pepper- near the stove for easy accessibility. An old mustard pot or small jar is handy for tasting spoons, cake tester sticks and a meat thermometer. 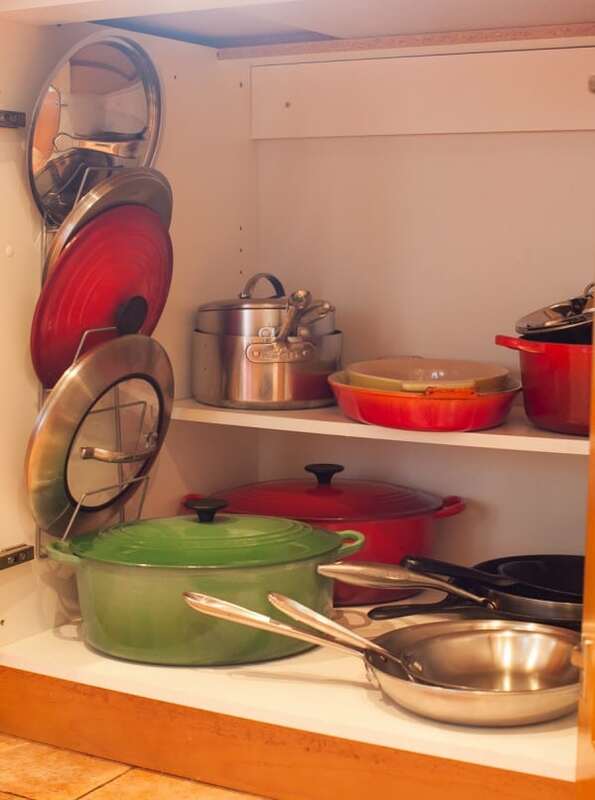 One last tip: invest in a pot lid rack if you can. They help you keep the pots and pans organized. This one is from Ikea. This is only the very beginning of a solid working relationship with my KitchenAid dual fuel range. As you can guess, this appliance will get put through its paces and it is totally up for the task. I look forward to bringing you many more recipes developed with it in the months and years to come. Questions? I’ll be around to chat in the comments. Thanks for reading! Aimee, how awesome! I can’t wait to test out my own KitchenAid oven and all the amazing options which come with it and the gas range! In the meantime, I’m enjoying vicariously through you! I can’t think of anyone who will get more good use out of their KA oven than you, cookie baker! Here’s hoping you don’t have to wait too long. What an awesome range- plus that Thanksgiving dinner looks fantastic!! Thanks, Heather. I remember that meal fondly – it was tasty! I love your oven. The features are incredible! Thanks, Naomi. I’m just beginning to discover all of them! That double oven is genius. 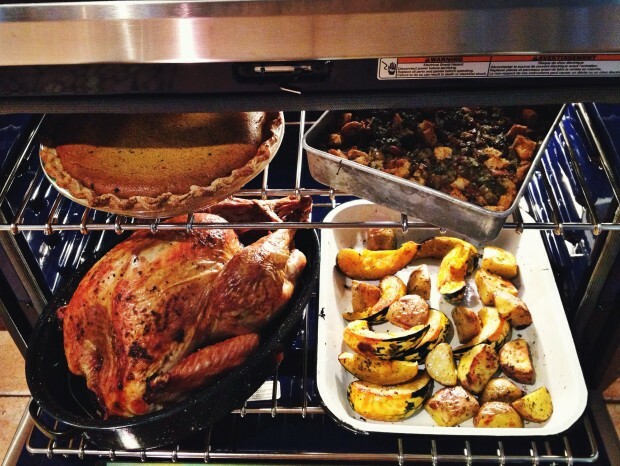 So glad you have such a gorgeous oven and range to work with! Sounds like pretty much the best Christmas ever, Pippa! I’ve got the same oven, purchased a couple of years ago. Oh goodness, it’s just a joy to work with, isn’t it? It really is! And I know it has so many perks that I will discover with time. Thanks for Posting Gas Stoves Gas Stoves. Now I’m coveting that oven range even more!! You are making me jealous with this! I want a gas stove so bad but we don’t have the appropriate hook-ups in our house. Darn. 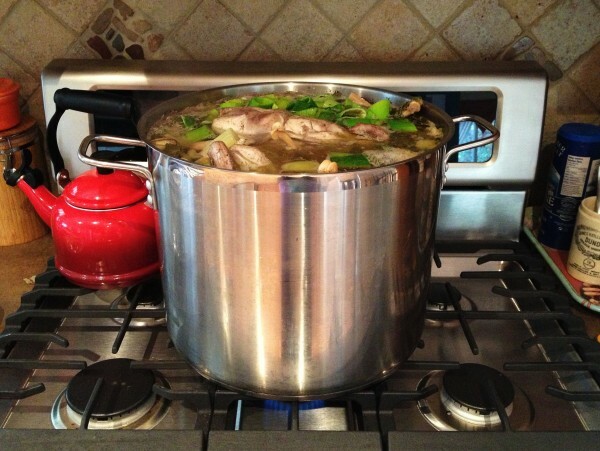 Holy chicken stock, Batman! 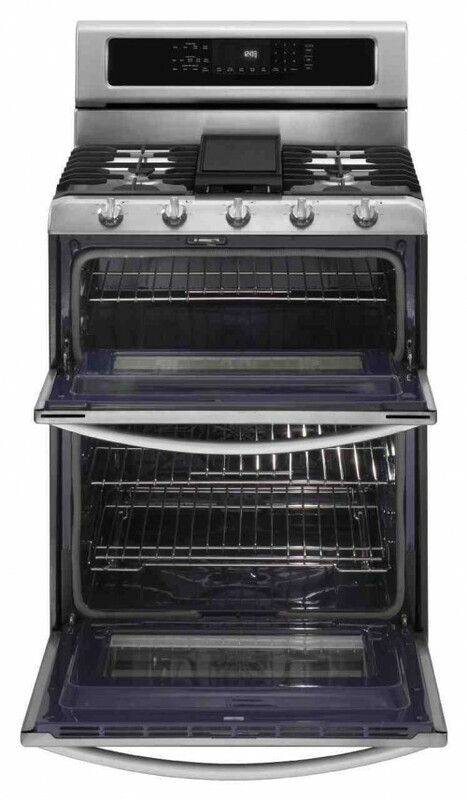 We’ll be getting a new range and oven soon and I’m DEFINITELY on board with the double oven. Hi. 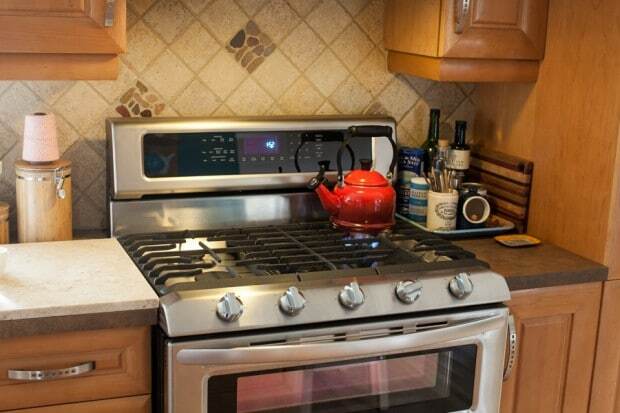 I found your blog because I was researching on the double oven Kitchen Aid stove. How do you like this stove? I am afraid the stainless top is hard to clean. Also, the crates on top. Are they easily scratched? If you have any inputs, please email me. I really appreciate it. Thank uuu..